Design a photo tea towel printed edge to edge and sewn to order. Use our personalised tea towel printing service for a modern tea towel gift for dad, granny or fun gift. Create a drying up cloth you design. Write your recipe, and use that to design your own tea towel to print with us, or make perfect teacher end of year presents. Full-colour tea towel printing with no minimum order. Our quintessential British tea towel made from natural cotton-linen fabric for 2nd anniversary gift or other idea. A blast into the past, this beautifully printed tea towel is like the school tea towels your kids bring home, but full-colour photo print quality and fantastic soft cotton-linen. Lightweight, so not for the sloppy dishwasher, but still a customised tea towel of considerable drying power. A 100% natural blend of cotton & linen and printed all over, this dishcloth tea towel is made from pesticide-free natural yarn that has a lower environmental impact than paper towels and will last for years to come. Your custom tea towel requires a little more tender love and care to ensure long-lasting colours. You can wash them in the machine at cold or delicates setting, or better still hand wash and they will retain their vibrancy. Granted not too many companies do what I needed to get done, I am pleasantly supposed with Bags of Love. Easy to order, fast delivery and very good quality on the final product. Definitely will use them again in the future. This was so simple to use. We had an idea for a fun wedding gift of tea towel using the map the wedding couple had supplied. All I needed to do was take a picture and upload to the site. There were a few editing options and a quality checker to make sure the final product would look good. Then online payment and the single personalised tea towel was delivered a few days later. We hear great things back from our customers about what they do with our tea towels. We had no idea they are so versatile and drying up is not their only purpose. Some of the things we get to hear about are great. For example, many people say the cloth is too good to use for menial tasks and they use it for tea cloth wall hanging, kitchen wall art, tea table runners, computer monitor covers, and dining table display with fruit bowls. Wow, we could go on but at the very least it is a three in one product. Let us hear your uses for the great British tea towel (the rest of the world don't do tea towels by the way). Care: Machine wash cold (delicates setting), or better still hand wash. Dry flat. Follow the care instructions to ensure lasting colours for a long time. Two-year guarantee on sewing. Why Print Tea Towels With Photos? Traditionally a tea towel would be a cloth that was kept in the kitchen. It has had many uses. The baking mums would use the super dry cloth to cover just baked cakes (yummy!) or cover teapots to keep them warm, and perhaps the most famous task of all was drying the dishes. It has lost out a bit to the dishwasher, but still, this very useful cloth can be found in British kitchens up and down the land, but now we can personalise them. Most grandparents and parents know the tea towel very well! Fortunately, the tea towel makes a serious come back in this day and age due to the opportunity to print and make your own tea towel allowing humour, design, photos and any graphics you want printed on your own tea towel to make a great gift idea for mum, dad, grandparents and friends. What is a tea towel? It's a British cultural icon! And we print and sew them here in London, one at a time. Some of our most recent ideas have been recipes handwritten and then scanned and printed and kids art. They all look great and mean something special too. There is something homely about the humble tea towel. That cherished handy cloth that is displayed in the kitchen can be made more of a centrepiece. You can use our tea towels for adding a little fun to kitchen chores like drying dishes, mopping up spills, and as decoration on the rail. Because you design your own personalised tea cloth you can cater to everyone. A bowls towel or a plate towel, you can use this tea cloth for anything you like. When Kate and Wills got hitched, the world of tea towels blossomed yet again. People love the royals on tea towels so if you are tempted to print tea towels with a royal design then you can, right here. You can design your royal tea towel as you see fit in any way you like, whether that is funny or in a more serious tone. If you get inspired by the royals, you can add photos of the royals or mimic them with your own alternative royal tea towel ideas. Did you see them on walkabout? Have you got any photos of the royals? You can add them and design your own layout on-line with text to make your own royal wedding tea towel. Or you can spoof it too! Use your own family photos to make a royal wedding tea towel for fun. There is not much custom tea towel printing in the UK any more. Even if you see Big Ben or Beefeaters tea towels at the Tower of London chances are that it was made in a distant land. Here, at Bags of Love, we print and make everything here in London with the latest in digital printing. So tea towel printing UK is at your disposal. Get inspired and create your own UK personalised cloth towel. Delivery in one to two days for a UK tea towel, and it's often next day delivery. Make your own tea towel or personalised tea towels with photos words or text. Make your own design in our online design system and enjoy the creative tea towel design experience we offer. Create personalised tea towels with Bags of Love as a special gift idea for someone. 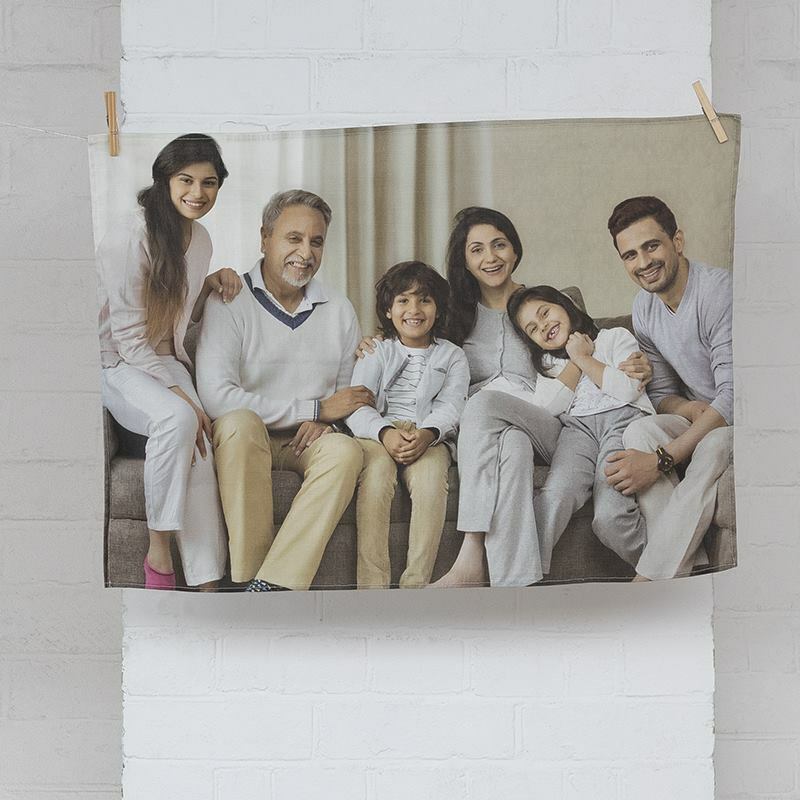 Print tea towels with your photos on. Our tea towels will accept a beautiful photo print. You can add words too. The processed photo tea cloth is deep fibre printed and means it can be washed, and it also means it will soak up water, unlike most other photo tea towels. Design your own tea cloth for a show, event, or personalised gift for someone special. If you like to make customised and bespoke products then this custom tea towel is a great choice. You design it online, then we print the textile, then we cut it and hem on all four sides. Make something out of the ordinary and design personalised tea towels for your relatives. Short of gift ideas for someone? Why not make your own personalised cloth and present it as a special gift, perfect for teacher end of year present! Seasonal tea towels are a great idea so constantly refresh your kitchen in a small way. Use bright colourful images throughout the summer, pinks and blues throughout spring, reds and browns throughout autumn, and create personalised Christmas tea towels for the winter time. With personalised seasonal tea towels, you can create something that is perfect for your kitchen as well as something that changes with the weather. Tea towels are incredibly versatile. You can cover a meal, use as a placemat, take on picnics, have as a decoration on the shelf or inside cabinets, serve warm bread under (Bags of Love favourite! ), or use as a table runner. You can, of course, use them to dry fine china and glasses. Our tea towels are excellent for drying wine glasses and leave no fibres, unlike most regular tea towels. 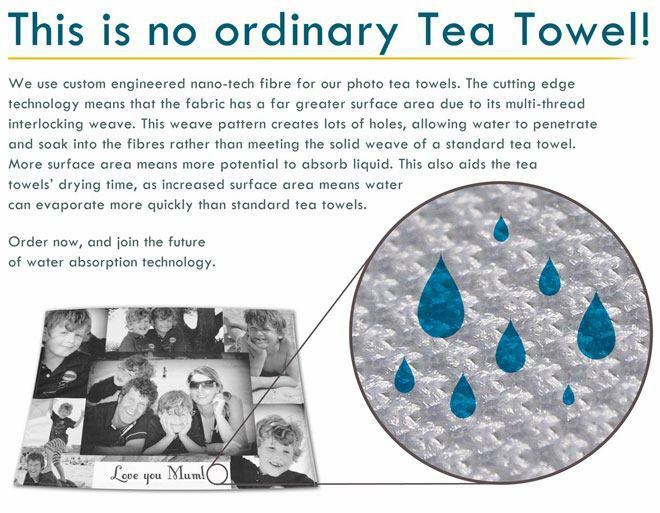 We may have the highest tech tea towel ever because it is digitally printed, and is made of high tech fibres with minute holes in the core of the fibre that soaks up the water.